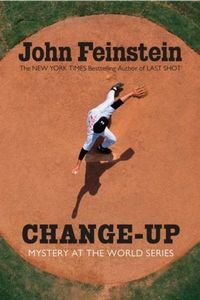 Change-up: Mystery at the World Series by John Feinstein: Synopsis and Online Purchase Options. Synopsis (from the publisher): Teen reporters Stevie Thomas and Susan Carol Anderson are covering baseball's World Series, and during the course of an interview with a new hot pitcher, they discover more than a few contradictions in his life story. What's he hiding? An embarrassing secret? A possible crime? Let the investigation begin! Change-Up is the fourth mystery in this series, which won an Edgar Award in 2006 for its debut title, Last Shot.